Yet another Brazilian exclusive game from Tec Toy, and one that is not particularly easy to get hold of either. Ren & Stimpy of course are taken from the well loved cartoon of the same name - and whilst the characters are (mildly) insane, they are still lovable in their own gormless kind of way! The question is, should you bother trying to find this game if it's going to take you time and effort? A good old platform adventure for the Master System! Of course, it is well known that the platformer is probably the best style of game for our console of choice - with the fan chosen top 100 games having platform games occupying both of the top two positions by a hefty margin from anything else! The gameplay here is very smooth indeed - in fact, the only reason I did not include it in my own personal voting list was because I didn't have it at the time I had to cast my vote! You can choose to play as either Ren or Stimpy at the beginning of each level, and the presentation screens prior to gameplay really are excellent - it honestly is amusing when you choose Ren and he picks up and folds Stimpy before putting him in his pocket!! 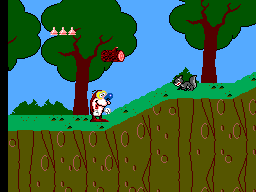 Throughout the levels, you have to destroy all of the animals that annoy you such as squirrels and vultures - all on that quest for the shaven yak! There are end of level baddies that do take genuine skill to beat, and each character is sometimes better suited for taking on each of your nemesis! 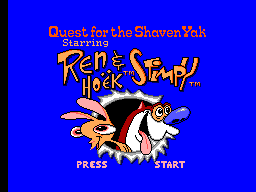 One of the great things is that each character has three lives, and if you lose a life with Ren, you have the option to continue your next go at the level with Stimpy! likewise, if your energy is low with one character at the end of a level, you can start the next level with the other. This may make you think that the game would be made rather easy with a total of 6 lives, but think again! The difficulty level is set just right so that you need most of these lives if you are going to progress with your mission. The whole game just gels and works, and I would honestly rate the gameplay up there with most of the Disney releases - even ahead of some of them. The graphics in Ren & Stimpy are first class. The character sprites are large, detailed and colourful, and are animated very well indeed. The backgrounds really are excellent - giving that unique cartoon feel apparent in the cartoon, and the enemies are very well done with some looking bad making you want to kill them - and others looking too cute, making you want to kill them even more!!! (Or is that just my evil side talking again??) I honestly can't think of any way the programmers could have improved on the graphics in this game. Once more, what can I say except - "the hills are alive..." - ok, I'll stop there before I get sued for copyright infringement, but once again, a truly excellent job has been made with the sound and music in Ren & Stimpy. The tunes create a fun atmosphere for the game - keeping with the style presented by the graphics, and the sound effects are just as good. One of the few times I will not fault the Master System in the sound department, so it must be a good thing! Controls are ultra responsive, jump, duck, fire etc. All easy to master, and no frustrations at all. Once again, all of the controls and resultant movements / actions are comparable to the Disney series which is very favorable indeed. 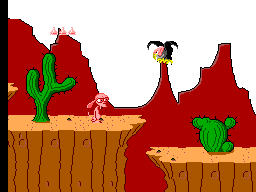 There is a huge amount of replay value in this game, starting from the first time you fail and lose all of your lives, to be greeted with a little end game sequence from Ren & Stimpy where they are very sad that they failed in their mission, only to happily tell you it doesn't matter and you can try again! The game is very very addictive, and also not too easy so you won't complete it the first time you play it. In addition, the novelty and comedy value of the game gives it a real charm that makes you want to come back again and again.